Jamming the RB block (383 to 440 cid) in the compact A-body Dart in 1968 must have seemed like madness… or brilliance! The Horsepower Wars were in full swing by ’68 and, in fact, 80 specimens of an especially potent Dart swallowed the (physically) larger 426 cid Hemi. 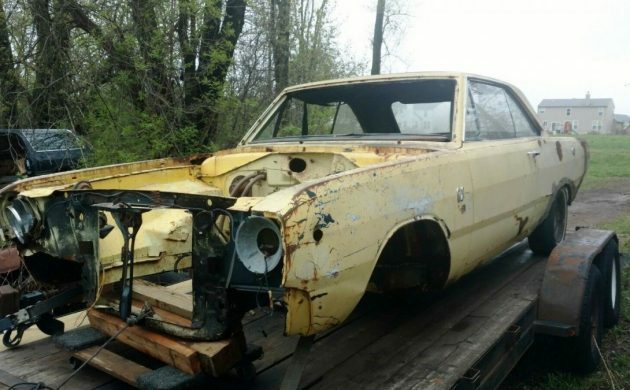 This neglected carcass of a 1968 Dodge Dart GTS in Rockford, Illinois seeks a new owner here on eBay where a $4,500 opening bid will get the auction started. As evident in the photographs, this vehicle needs more than a thorough waxing. 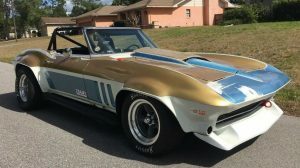 The seller states “Engine and all engine components, front suspension, k-frame, front brakes, bucket seats, steering column and wheel, and console missing.” Yikes! 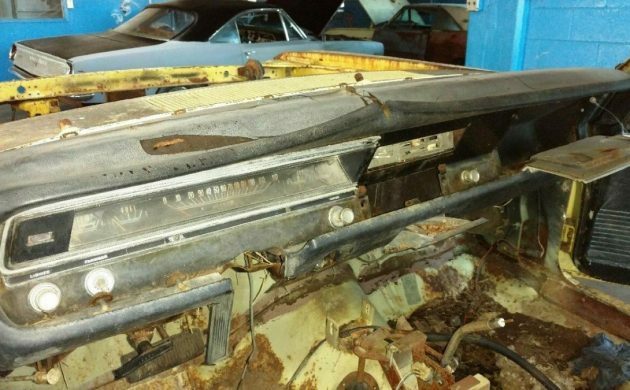 Still, we see rustier Mopars every week, and someone with a wrecked GTS might decide to make a go of building one car from two. Right, so… not much to see here. However, you might spot the shifter, reportedly connected to the original three-speed automatic. The door panels, dashboard (such as it is), glass (all good), 8 3/4″ rear end, and a “nice GTS hood” come with the sale. Things are looking up! The two-tone yellow suggests a re-spray at some point in the car’s life, but none-the-matter because it will soon earn another one. The VIN decoder at tpocr.com and fender tag decoder at mymopar.com bear out the claims of an original Dart GTS with the 383 and three-speed automatic. Other Day One equipment included the nifty red side-wall tires, 3.23 axle ratio, yellow paint, AM radio, and windshield tint. If you wanted a big helping of motor in a small bowl, this was your ticket to greatness, and other tickets as well. 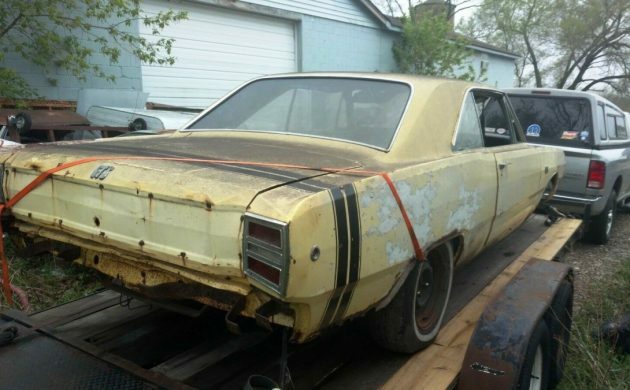 Do you have what it takes to restore this high-powered compact? Nice work, Todd! I could see a 3-day reality show deadline on Fitch’s Garage (coming to a channel near you) and you’d have this thing buttoned up, no prob. Thanks, Scotty, and sure, no problem! I just can’t decide whether to re-power it with a 900+ cid Seagrave V12 or maybe a Peugeot Turbo-Diesel. With its manufacture fully amortized, this Dart (with any engine) probably represents a lower total environmental impact than a new Prius. Someone might as well enjoy it! I’ll have my agent call your people to discuss the reality show pitch. I’ll have to hire a couple arrogant know-it-alls for the staged Garage Tension bits. It would not be hard to find a couple arrogant know-it-alls. This car is to much work for me, but I do like the Cuda. Nice write up Todd, Thanks, Mike. 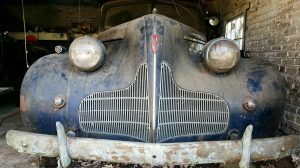 I do not have what it takes to restore this car! Unfortunately most of my mechanical aptitude focuses on the unsealing of various types of beer containers. While I haven’t won any awards for this skill I am well noted around my house for this ability. I think you live right up the road from me NotSure, swing by on that beer run! Has anybody noticed the detached trim tag shown in the EBay ad has a different VIN than the one listed in the ad for the car? I always question a detached trim tag. There is no reason at all to remove it. In this case it looks like the seller is trying to get you to believe the car he is selling had options it probably never had. Looking at photo where they cleaned off vin # on radiator support it appears that doesn’t match the other two. Me thinks things ain’t what they are said to be. Another point. You will notice where the trim tag was, it has dark yellow paint all around it. That would lead me to believe the trim tag was painted that darker yellow. The trim tag looks to be some sort of beige color. It could be the light yellow but it doesn’t look like it to me. The tag also could have been masked, which I doubt considering all the other over spray all over the car, but it is just one more piece of the puzzle. 68 trim tags don’t carry the V.I.N. The number on the tag is the shipping order number. Ray B, I have the Catalog of American Car ID Numbers 1960 – 1969. That book clearly states that the last six numbers on that trim tag is the production sequence and matches the VIN. Man, I have all the parts to make it. Just not the money to buy it/ship it home. Damn! Love these cars. At least it’s not an M code. Then I would find the money. Hope this gets the rebuild/finish it deserves. cold340t, do you think $4500 is a good price for what is offered here? Miguel;as I understand you have Mexican roots and we’re talking A bodies here;any idea how alike/unsimilar the US 2dht Darts are to the South American A body based Chargers, Super Bees etc?Are they still around, how is quality and are they collectibles locally? I ask as I’ve never seen a non US A body IRL and I’ve long wondered if parts would interchange? If it’s a real 383 car, then yes. I would be willing to pay that, but not more then $6k as it sits(with delivery). I say this because I have a whole 68′ 340 GTS front end already. 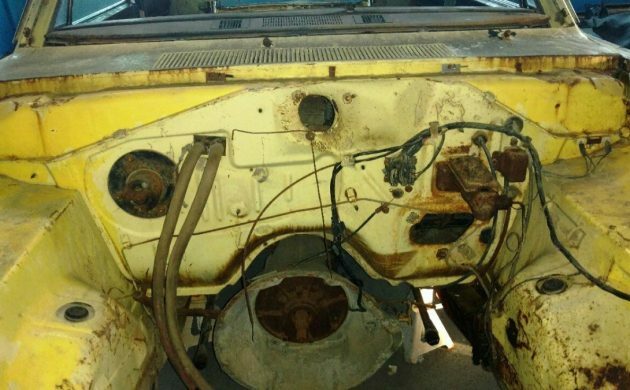 Plus another 69′ 340 parts car for interior etc.. If I was starting from scratch. I wouldn’t be much interested. I admit though that I am sucker for 67′-69 Darts. Just thinking about buying this one is making me remember I shouldn’t! Must resist! Mopar or No Car! If it was an M Code, it would already be on it’s way to my house. At least if it was $10k or less in that condition. local_sheriff, I don’t know anything about the South American cars. I have never seen one in person. As far as the Mexican cars, I think most of the part would interchange, however a lot of the time in the ’70s, they used Plymouth on one end of the car and Dodge on the other. The did sell a GTS here in 1967 through 1969, but it only had a 318. Big blocks were never sold here. Here is the GTS I am looking at here. If they ever get the gas problem straightened out in Guadalajara, I am going to go over there to get it. Trim tag and vins in 1968 on mopars rarely match up – 1969 was the go year. If that is the case, how do you know those trim numbers go to that car? I have 1963 Chrysler products and they have the last numbers of the VIN on the trim tag. 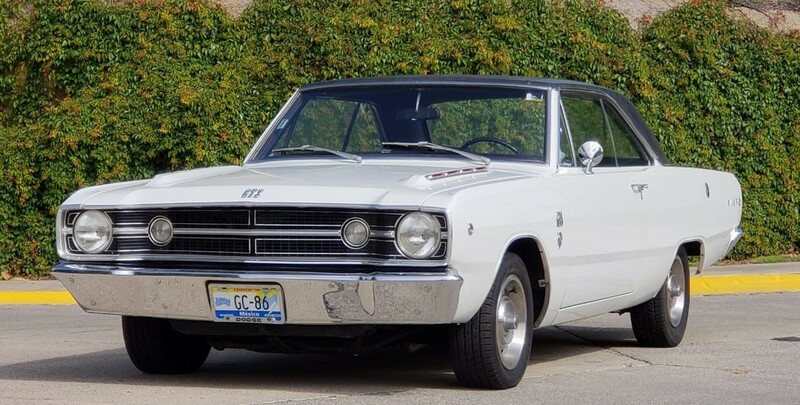 Why wouldn’t a 1968 Dart? The 7 1968 mopars I’ve owned all matched numbers on dash trunk rad support and trim tag. Always checked before I bought them. Got sting once. Back in the day when Street Outlaws drove and raced real street cars I had a 69 Dart. It wasn’t a GTS. It started life as a 6 cylinder car. I changed the K frame and dropped in a 13:1 440 with a 4 speed. Headers through the fenderwells for clearance a 390 rear. That car was so fast. Definitely my fastest car. The biggest problem was traction. Or it would have been even faster. My everyday driver. Lol Sunoco Gas. No tubs just cut quarter openings to fit the tires. 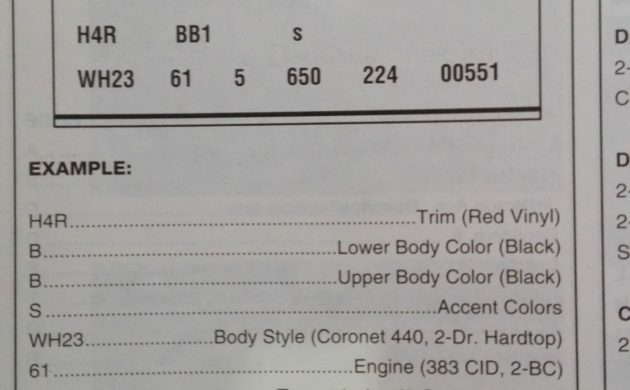 That would also go for the rad support and back trunk – but those three – the trim tag/rad support/trunk lip should for 1968….K-frame is gone and most likely under another car…..so here again are some numbers up for grab….nice color though. Besides the letters on the trunk, is there anything that would make anybody believe this is actually a GTS? Another rusted shell that is without an engine, interior, front and rear trim/parts? $4,500 for that? My brotherlaw had 3 1969 Dart GT convertible. Two with 340s and the third one with the 383. He past away in 2011. My sister still has the big block. It brings back a lot of good memories. Rare enough to restore. But the buy in is in my opinion steep. 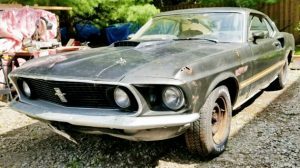 I bought a 68 GTS 383 complete numbers matching barn find for a little over double this guys ask. You could not find the missing parts for the difference. A lot of wrong info here. First, 1968 trim tags do not have a V.I.N stamped in them. They have the six digit S.O (shipping order) number stamped. That number will never ever match the V.I.N. That number was also stamped on the radiator support, under the trunk weather strip, on the driver side quarter panel, on the engine block, and transmisson. The core support number on this car absolutely matches the S.O number on the tag. Don’t let the extra two digits stamped in the support fool you. They supposed to be there. 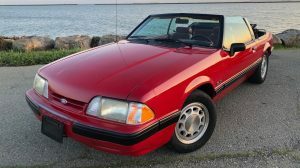 If anyone here is interested in this car, and has any questions. Call the owner. 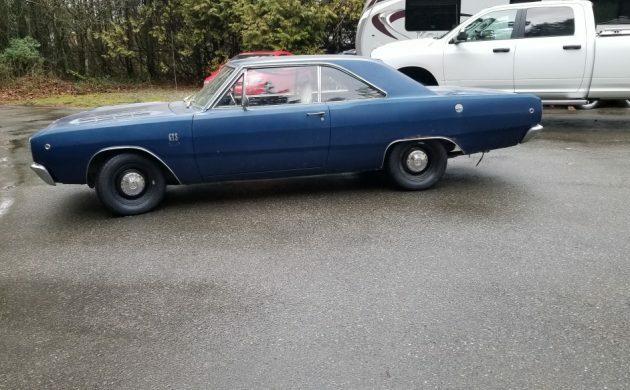 The owner of this car is considered by many in the hobby to be the 67 to 70 Dart Guru, and has helped many into these cars with info. Miguel, back in the ’50s Chrysler products from Canada, the Dodges & Plymouths from what I remember had mismatched noses & tails . Craig, Mexico had that too. I looked at a 1958 that had a DeSoto front end and a Plymouth rear end with the Plymouth dash, like Christine, but it said DeSoto. Too bad it had too much hidden rust. Mother Mopar played a wicked game of mix-n-match parts, to sell wholly hydrid cars in non-U.S. markets. Even Canada got Plymouths with Dodge noses and goofy, low end interiors, but always with the fancier name. Like passing off a Chevy with Cadillac badges as a real Cadillac. Never have understood the logic or business model behind this strategy. Maybe they sold the cars at the fancier car price ??? Isn’t same-same mass production the cheapest manufacturing method ? I find it hard to believe there was any real sales advantage that overrode the cost of all the mix-n-matching. In the days before NAFTA and other world wide trade agreements the automobile export business was hit with both huge import duties and local content laws. Auto manufacturers found it cheaper to set up plants in other countries but they may not produce exactly the same car as in in the US. A lot of times the obsolete but still good dies and tooling were shipped to other countries to be used for years after. Like the basic Rambler American body was made in Argentina into the 80’s with what was basically a Kaiser engine. This scenario was repeated worldwide with numerous variations. Only with the advent of free trade agreements has the worldwide auto production has been shifted to different counties(usually low wage labor). A lot of countries that used to no longer have a home brew domestic automobile production or they build cars under license. Just a thought, is not the Registration worth that amount. I do agree that you will need most of parts on hand or it will be a lost cause. The body not matching the Vin # may drop the price somewhat, but not as much as it being a slant six Vin. and turning it into a 383 ride. Note: Must be a clear Title, possible on both. John B you are correct the 383 and 400 (maybe 361) were B blocks or big block. The 426 Hemi and 440 were RB or raised block engines. I’m surprised Todd made that id error but no one perfect. Glad someone else caught that. 413 & 426 street wedges as well as maximim performance 426 wedges were RB engines too. But I’d bet you knew that. Picking nits here for accuracy, but the RB series also included a 383. Not the same 383 as the B-block, but a long stroke unit. It was out of production by 62, I believe. They were a Chrysler-only installed engine, sold in the Newport and Saratoga/Windsor series cars in the U.S. Not sure about outside the domestic market. I have seen cars like this with the serial number stamped on the unibody rails at 2 places. Wonder why no one knows or speaks of those places? John B, all raise blocks(RB) had that mount in the top front of the motors, including the 413(should be a ci stamp for which motor it is). 383 and 400 were big block(B). CI are also cast on side of blocks along with the year of production, but not necessary the year of the car. Example: A late month in 68′ could be a 69′ model year. Thanks for refreshing my tired memory, I sure do recall popping a lot of hoods in junkyards 40 years ago looking at all the small differences in Mopar factory setups! B-block was originally the DeSoto engine (1958). as Mopar moved away from divisional thinking to corporate-wide. The RB was Chrysler, with Dodge having their D500 option as the DeSoto 361. The RB is simply a decked B-block, giving more cubes through a longer stroke. The 361 B-block used the same pistons as the 383 RB. The B-block rapidly spread across all divisions and the RB block was dropped from the smaller displacements. Just too leggy. The 383 B-block’s more square bore and stroke delivered more punch and fewer problems. 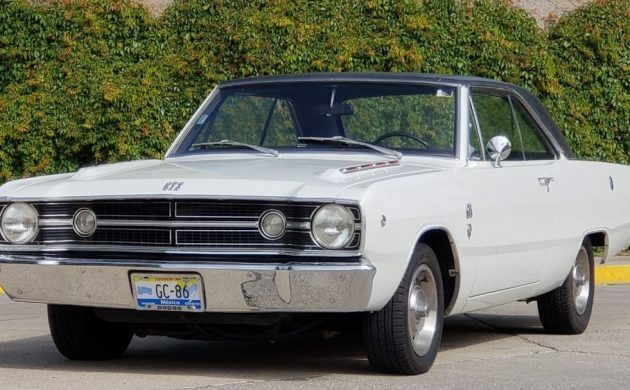 As for this Dart, if the hulk is what the seller claims it to be, and a builder really wanted a GTS, the price seems “in the ball park” for someone who doesn’t want to spend 5-10 years without one, looking for a better deal. These are outside my scope of knowledge to know how hard ot would be to find a better one, but I do know the frustration of the hunt for unobtainium, and will often “overpay” for something to get the job done and get on to the fun of ownership, than to spend a lot of months/years and money searching. Restoration is a specialized business, with a lot of special tools and equipment. How one views a hulk like this depends largely on the shop in which a buyer has to drag it home to. Peeling this car back to a bare body and building it to a solid starting point is the easy part for me. If I had a pile of relevant parts and parts cars, the rest might be easy too. If a buyer had neither, this would be a stiff undertaking. The value all depends on a person’s shop resources, depth of pockets, and desire to own that particilar car. The over 3″ in wheelbase and 7″ in length over a Valiant made these Darts the most ideal size car ever made in my opinion. Wish they had kept making them the last 50+ years. The chiseled good looks of the 66-67 Coronets looked just as good on the slightly sized down 67-69 Darts. They were good cars from looks to performance to being easy to work on. Wrong info there Burger – the 350/361 B motor was first offered in 1958 you could get a 350 in the Plymouth Fury’s and a 350/361 in a Dodge in 1958 – the first year for the wedge that would become the 383 and the derived 383-RB – 413-RB – 426-RB and the 44O-RB. The 350 was the dedicated DeSoto Firesweep engine in 58. Plymouth got it as a kickdown option for their top line Fury. Otherwise, they retained the old Plymouth V-8 options and the inline six. 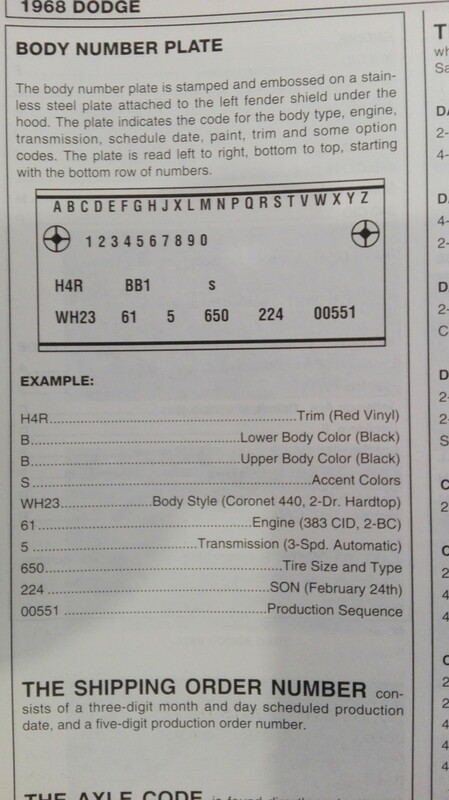 Dodge played the same game, but being a step up from Plymouth, they got the 361 as their HP option. Unlike other divisions that borrowed the DeSoto wedge as PART of their engine lineup, the 361/350 was the ONLY engine offered in ANY DeSoto for 58. Things were rapidly changing around the Mopar stable in the 57-60 period. In 59, Chrysler joined DeSoto in abandoning all other engines but the wedge. To give Chrysler the appearance of being more “upline”, they got the RB design in both 383 and 413 displacements. DeSoto dropped the 350 displacement and added the 383 B-block design for their Fireflite and Adventurer series (maybe Firedome too ? ), with Firesweep getting the 361. But 1959 was the year that “corporate” allowed lots of crossbreeding of engines and models, and the special dual quad Adventurer B-383 was available in ANY DeSoto a buyer wanted to stuff one in. I lose track of how Dodge and Plymouth handled the yearly “upgrades” after 58, as models began to go nuts and engines became available across all models, where they were restricted before. If memory serves, the RB-383 was dropped in favor of the B-383, and the B-383 became the corporate standard through the muscle years. I’m surprise the torsion bars are still in place. If you need the “K” member you would think you would need the torsion bars. Every type of mopar motor needs a different set of torsion bars to handle the weight change, unless they are using them for drag racing and you would want a size lower to transfer the engine weight to the rear of the car for added traction.